Lucy Eldine Gonzalez Parsons (c. 1853 – March 7, 1942) was an American labor organizer, radical socialist and anarcho-communist. She is remembered as a powerful orator. Parsons entered the radical movement following her marriage to newspaper editor Albert Parsons and moved with him from Texas to Chicago, where she contributed to the newspaper he famously edited—The Alarm. Following her husband's 1887 execution in conjunction with the Haymarket affair, Parsons remained a leading American radical activist, as a founder of the Industrial Workers of the World and member of other political organizations. Lucy (or Lucia) Eldine Gonzalez was born in 1853, in Buffalo Creek, Texas, although she listed Virginia as her birthplace on her children's birth certificates. On her death certificate, her parents' names were listed as Pedro Díaz and Marites González, both born in Mexico. Parsons may have been born a slave, to parents of Native American, African American and Mexican ancestry. In 1871, she married Albert Parsons, a former Confederate soldier. They were forced to flee north from Texas due to intolerant reactions to their interracial marriage. They settled in Chicago, Illinois. Lucy Parsons' origins are not documented, and she told different stories about her background so it is difficult to sort fact from myth. Lucy was probably born a slave, though she denied any African heritage, claiming only Native American and Mexican ancestry. Her name before marriage to Albert Parsons was Lucy Gonzalez. She may have been married before 1871 to Oliver Gathing. Described by the Chicago Police Department as "more dangerous than a thousand rioters" in the 1920s, Parsons and her husband had become highly effective anarchist organizers primarily involved in the labor movement in the late 19th century, but also participating in revolutionary activism on behalf of political prisoners, people of color, the homeless and women. She began writing for The Socialist and The Alarm, the journal of the International Working People's Association (IWPA) that she and Parsons, among others, founded in 1883. In 1886 her husband, who had been heavily involved in campaigning for the eight-hour day, was arrested, tried, and executed on November 11, 1887, by the state of Illinois on charges that he had conspired in the Haymarket Riot — an event which was widely regarded as a political frame-up and which marked the beginning of May Day labor rallies in protest. Parsons was invited to write for the French anarchist journal Les Temps Nouveaux and spoke alongside William Morris and Peter Kropotkin during a visit to Great Britain in 1888. In 1892 she briefly published a periodical, Freedom: A Revolutionary Anarchist-Communist Monthly. She was often arrested for giving public speeches or distributing anarchist literature. While she continued championing the anarchist cause, she came into ideological conflict with some of her contemporaries, including Emma Goldman, over her focus on class politics over gender and sexual struggles. In 1905 she participated in the founding of the Industrial Workers of the World (IWW), and began editing the Liberator, an anarchist newspaper that supported the IWW in Chicago. Lucy's focus shifted somewhat to class struggles around poverty and unemployment, and she organized the Chicago Hunger Demonstrations in January 1915, which pushed the American Federation of Labor, the Socialist Party, and Jane Addams' Hull House to participate in a huge demonstration on February 12. Parsons was also quoted as saying: "My conception of the strike of the future is not to strike and go out and starve, but to strike and remain in, and take possession of the necessary property of production." Parsons anticipated the sit-down strikes in the US and, later, workers' factory takeovers in Argentina. In 1925 she began working with the National Committee of the International Labor Defense in 1927, a communist-led organization that defended labor activists and unjustly-accused African Americans such as the Scottsboro Nine and Angelo Herndon. While it is commonly accepted by nearly all biographical accounts (including those of the Lucy Parsons Center, the IWW, and Joe Knowles) that Parsons joined the Communist Party in 1939, there is some dispute, notably in Gale Ahrens' essay "Lucy Parsons: Mystery Revolutionist, More Dangerous Than A Thousand Rioters", which can be found in the anthology Lucy Parsons: Freedom, Equality, Solidarity. Ahrens also points out, in "Lucy Parsons: Freedom, Equality and Solidarity: Writings and Speeches, 1878–1937", that the obituary the Communist Party had published on her death made no claim that she had been a member. Lucy Parsons' feminism, which analyzed women's oppression as a function of capitalism, was founded on working class values. Emma Goldman’s feminism took on an abstract character of freedom for women in all things, in all times, and in all places; her feminism became separate from its working class origins. Goldman represented the feminism being advocated in the anarchist movement of the 1890s [and after]. The intellectual anarchists questioned Lucy Parsons about her attitudes on the women's question. Parsons was solely dedicated to working class liberation, condemning Goldman for "addressing large middle-class audiences"; Goldman accused Parsons of riding upon the cape of her husband’s martyrdom. "[N]o doubt," Candace Falk wrote (Love, Anarchy, and Emma Goldman), "there was an undercurrent of competitiveness between the two women. Emma generally preferred center stage." Goldman planned on preserving her place in the spotlight as an American anarchist laureate by shoving risqué sexual and kinship discourse into "the center of a perennial debate among anarchists about the relative importance of such personal issues". Parsons responded: "The line will be drawn sharply at personalities as we know these enlighten no one and do infinitely more harm than good." Goldman, in her autobiography, Living My Life, briefly mentioned the presence of "Mrs. Lucy Parsons, widow of our martyred Albert Parsons", at a Chicago labor convention, noting that she "took an active part in the proceedings". Goldman later would acknowledge Albert Parsons for becoming a socialist and anarchist, proceeding to praise him for having "married a young mulatto"; there was no further mention of Lucy Parsons. Parsons continued to give fiery speeches in Chicago's Bughouse Square into her 80s, where she inspired Studs Terkel. One of her last major appearances was at the International Harvester in February 1941. Parsons died on March 7, 1942, in a house fire in the Avondale Community Area of Chicago. Her lover, George Markstall, died the next day from injuries he received while trying to save her. She was believed to be 89 years old. After her death, police seized her library of over 1,500 books and all of her personal papers. She is buried near her husband at Waldheim Cemetery (now Forest Home Cemetery), near the Haymarket Martyrs' Monument in Forest Park, Illinois. On October 15, 2015, a copy of William Morris's Signs of Change: Seven Lectures Delivered on Various Occasions was sold at auction in England. It was inscribed "To Lucy E Parsons from William Morris November 15, 1888", bore a "Property of Federal Bureau of Investigation US Department of Justice" stamp, and a "Surplus Library of Congress Duplicate" stamp; some of its pages showed traces of smoke damage. The Lucy Parsons Center was founded in 1970 in Boston, Massachusetts. It continues as a collectively-run radical bookstore and infoshop. 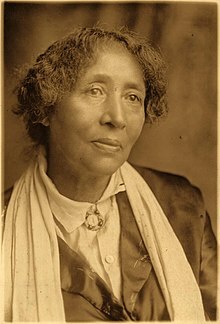 The 1989 short film Lucy Parsons Meets William Morris: A Hidden History, written, directed and produced by Ruth Dunlap Bartlett (aka Helena Stevens), fictionalized Lucy Parsons' 1888 visit to London. In the 1990s, a local Chicago artist installed a memorial to Parsons in Wicker Park. In 2004, the City of Chicago named a park for her. On July 16, 2007, a book that purportedly belonged to Lucy Parsons was featured on a segment of the PBS television series, History Detectives. During the segment it was determined that the book, which was a biography of Albert Parsons' co-defendant August Spies' life and trial, was most likely a copy published and sold by Parsons as a means of raising money to prevent her husband's execution. The segment also provided background on Parsons' life and the Haymarket Affair. In 2016, The Nation magazine released free and online a short film by animator Kelly Gallagher about Lucy Parsons, "More Dangerous Than a Thousand Rioters: The Revolutionary Life of Lucy Parsons." A feature film is being made about Lucy Parsons, Albert Parsons and The Chicago Anarchists. ^ "Lucy Parsons: Woman of Will | Industrial Workers of the World". www.iww.org. Retrieved May 1, 2018. ^ Henderson, Lori (2008). "Memory of Controversy and Controversial Memories: Lucy Parsons and the Haymarket Tragedy" (PDF). Historia. Eastern Illinois University. 17: 13–23. Retrieved March 8, 2016. 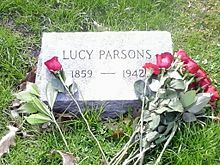 ^ "About Lucy Parsons". The Lucy Parsons Project. Archived from the original on January 30, 2012. Retrieved February 22, 2018. Born in Texas, 1853, probably as a slave, Lucy Parsons was an African-, Native- and Mexican-American anarchist labor activist who fought against the injustices of poverty, racism, capitalism and the state her entire life. ^ Johnson Lewis, Jone. "Lucy Parsons: Labor Radical and Anarchist, IWW Founder". ThoughtCo. Retrieved February 21, 2018. ^ Foner, Philip S. (1986). "The First May Day and the Haymarket Affair". May Day: A Short History of the International Workers' Holiday, 1886–1986. New York: International Publishers. pp. 27–39. ISBN 0-7178-0624-3. ^ a b "Lucy Parsons: American Anarchist". Anarchist Writers. Retrieved August 14, 2013. ^ "Lucy Parsons: Woman Of Will." Industrial Workers of the World. ^ Ashbaugh, Carolyn (1976). Lucy Parsons: American Revolutionary. Chicago: Charles H. Kerr Publishing. ISBN 0-88286-005-4. ^ a b Falk, Candace. Anarchy, Love, and Emma Goldman. p. 66. ISBN 0-03-043626-5. ^ Parsons, Lucy. "On Variety", The Firebrand, September 27, 1896, Free Society; also in Ashbaugh, 204. ^ Goldman, Emma. Emma Goldman: A Documentary…, pp. 312-313; originally featured in Part IV, Letters from A Tour, Sturmvogel, November 15, 1897. ^ Parsons, Lucy. "Salutation to the Friends of Liberty", The Liberator Chicago, September 3, 1905; Lucy Parsons, Ahrens, ed., p. 88. ^ Goldman, Emma (1931). Living My Life. Alfred A Knopf. ISBN 0-486-22544-5. ^ a b Watkins, Nancy (November 9, 2008). "Who Loves Lucy?". Chicago Tribune Magazine. Tribune Co. p. 23. Retrieved September 7, 2013. ^ "Haymarket Widows". The Lucy Parsons Project. Archived from the original on March 7, 2012. Retrieved February 22, 2018. Lucy Parsons and her companion George Markstall, with whom she had lived since around 1910, died in a fire at their Chicago home in March 1942. ^ Howard Besser, "Lucy Parsons Memorial", April 3, 1996. ^ Gallagher, Kelly (November 15, 2016). "More Dangerous Than a Thousand Rioters: The Revolutionary Life of Lucy Parsons" – via www.thenation.com. "A Word to Tramps," The Alarm, vol. 1, no. 1 (October 4, 1884), p. 1. "An Interview With Lucy Parsons on the Prospects for Anarchism in America," St. Louis Post-Dispatch, vol. 37, no. 95 (October 21, 1886), p. 4. Carolyn Ashbaugh, Lucy Parsons: American Revolutionary. Chicago: Charles H. Kerr Publishing Co., 1976. Paul Buhle and Nicole Schulman, Wobblies! A Graphic History of the Industrial Workers of the World. New York: Verso, 2005. Jacqueline Jones, Goddess of Anarchy: The Life and Times of Lucy Parsons, American Radical. New York: Basic Books, 2017. Dave Roediger and Franklin Rosemont (eds. ), A Haymarket Scrapbook. Chicago: Charles H. Kerr Publishing Co., 1986. Keith Rosenthal, "Lucy Parsons: 'More Dangerous Than a Thousand Rioters'", Joan of Mark, September 6, 2011. "Lucy Parsons Is Burned to Death in Chicago; Husband Was Hanged After Haymarket Riot", the New York Times, March 8, 1942, p. 36.